Call them buggies. Call them pushchairs. Call them strollers. Whatever you call them, they’re brilliant: nimble enough to nip around shops, tough enough to withstand toddler tantrums and usually much easier to push around than a traditional pram. But while buggies clearly aren’t made equal - a £30 buggy won’t be as well-made as a £300 one - it’s possible to spend hundreds and even upwards of £1,000 on some strollers. Should you? That depends both on your budget and your own lifestyle. The best thing to do when considering what to buy is to think about what you’ll be doing. Do you love to shop? Slim and maneuverable should be the top of your list. Public transport? Lightweight buggies are your friends. Running or hiking or just pounding terrible pavements? Look for buggies with big wheels. Some buggies are compatible with car seats, others can be expanded to carry two children, some are so small you can stick them in the overhead locker of an aeroplane and some have so many customisation options you’ll feel like you’re buying a car. But whether you need a budget bargain or have more money than you know what to do with, these are the buggies we think are best. Maclaren buggies are incredibly popular and with good reason: the near-flat option means they’re suitable for really young children, the rubber wheels and suspension cushion your child from lumps and bumps, and the combination of a very small footprint and a narrow frame means it’s a star in tight spaces such as shop aisles or car parks. It’s a little bit taller than other buggies, and you can extend the handlebars another two inches - a godsend if you’re tall, as it means you don’t have to walk funny to avoid kicking the buggy. It’s tough, too: our Maclaren has survived nine years and two children, and it’s as solid as the day we bought it. It’s not the cheapest buggy around, but you won’t regret buying it. The Bee5 isn’t so much a pushchair as a science project: it’s incredibly customisable with a range of canopies, seats and accessories, and that means it can be hard to price: for example, the John Lewis price at the time of writing doesn’t include a sun canopy as standard, and that’ll set you back an additional £69 to £89. It’s pretty, but it’s pretty clever too. The seat can be mounted forwards or backwards, all four wheels have suspension and it’s easy to fold and unfold. Like the McLaren the handlebars are extendable for tall people, and the fabrics are removable and washable. 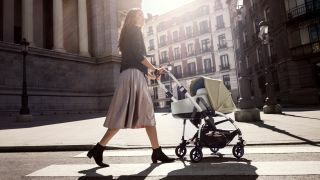 It’s a very stylish urban buggy, and while it’s at the higher end of the market it’s beautifully engineered and endlessly flexible. If you want to take baby off the beaten track or like us, just need to deal with terrible pavements and potholes, then the Sport 2 is a marvel: its massive 12-inch wheels laugh at lumps and bumps, and there’s a clever brake that only lets the buggy move when you’re holding the handlebars. Even cleverer, there’s the option to add a second seat (suitable for children up to the age of 5) so the buggy can grow with your family. That means the price doesn’t look quite so high. It’s much smaller than it looks - just 59cm wide - and fits happily in the average car boot, and it’s very nippy in and around town. If you’re the active type we think you’ll like the Sport 2 a lot. Let’s get the negatives for this pushchair out of the way first. You can’t adjust the handlebars and the shoulder straps are a bit fiddly. There are plenty more positives though, and not just the price: the Pop 2 is exceptionally light and easy to move around - although at 7.2Kg it’s a little heavier than the first Pop - and it’s suitable for kids up to 25Kg, which means five or six years old. It’s brilliant in shops, looks fantastic and feels much more expensive than it actually is: lots of shops offer discounts that make it considerably cheaper than similar buggies such as McLarens. We wouldn’t want to take it off-road but if you’re looking for a lightweight city stroller the Pop 2 should definitely be on your shortlist. The GB Pocket made it into the Guinness World Records 2014 as the world’s smallest commercially available folding stroller. It’s just 30 x 18 x 35cm when folded and weighs 4.3Kg, but it’s strong enough for kids weighing up to 17Kg. Its tiny size means you can fit it into the overhead locker on an aeroplane, which may be reassuring if you’ve seen the way strollers get chucked around by some baggage handlers. That also means it’s great for people with small city cars, which don’t have much room in the boot. You’re not going to get very far off-road with such a lightweight buggy and by its very nature it doesn’t feel as solid as heavier, bulkier buggies, but for everyday urban use it’s great: lightweight, very maneuverable and particularly good for public transport.